The toppling of the Berlin Wall sparked tremendous changes, but few could have predicted that its fall would mark the beginning of a real estate boom. From Europe to Asia, a different kind of “domino effect” occurred in which property values in one Communist country after the other skyrocketed over the ensuing decade.1 In Estonia, for instance, the average price in Euros per square meter of an apartment2 in the capital city of Tallinn increased from 300 € ($400 USD) to 2000 € ($2600 USD) between 1997 and 2007.3 On the other side of the globe, Vietnam’s annual GDP growth reached nearly 10%, and in 2007 saw more than $18 billion in Foreign Direct Investment (FDI)—much of which naturally went towards real estate development and passive investment. 4 As developers, investors, attorneys and builders struggle with the current global real estate recession, it might behoove them to consider positioning themselves to capitalize on the potential explosive growth of perhaps the last former Soviet satellite nation. By reflecting both on its turbulent past as well as its complex present, this paper sets out to analyze the undeniable allure of real property investment in Cuba. The baseline authority that governs real property in Cuba is the Cuban Constitution. According to Article 15 of the Constitution, virtually all land in Cuba is “Socialist state property, which is the property of the entire people.”18 But for a few narrow exceptions, all land is owned by the GOC; this includes the subsoil, mines, mineral, plant and animal resources, forests, waters and “means of communications.”19 In addition, Art. 15(b) states that all means of production—sugar mills, factories, banks and “economic facilities” nationalized “from the imperialist landholders” fall under this large umbrella.20 As alluded to previously, there a few exceptions. According to Pedro Freyre, Co-Chair of the Global Practice Group at Akerman Senterfitt law firm, Cubans, in effect, cannot own land but for “a few very narrow carve-outs for agricultural cooperatives…everyone else is a tenant of the state and possesses the property as a life estate.”21 Art. 19, in fact, states that “small farmers” have the right to legal ownership of their lands “necessary for the exploitation of their land, as prescribed by law.”22 While the Constitution allows farmers to “sell their lands, swap them or transfer them for another title,” this may only be done where that sale is to the GOC or to other small farmers and “without detriment to the preferential right of the state to the purchase of the land while paying a fair price.”23 Further, Art. 19 bans any land leases, mortgages or other acts which “entail a lien on the land” or “cessation to private individuals” of the small farmer’s rights to that land.24 In sum, the GOC is unequivocal in its message to prospective Cuban real estate investors: think again. However, taking a broader view of what it means to “invest” in Cuban real estate, there remain additional opportunities for Cubans to participate in this sector. WHO MAY INVEST IN CUBAN REAL ESTATE? Exchange System: In the United States, the §1031– tax deferred exchange enables the savvy real estate owner to defer capital gains taxes by effectively applying proceeds from the sale of one property towards the purchase price of a subsequent property.25 Investors privy to the power of this law make use of it on a regular basis. While this is a useful tool, obviously this is not the only means by which one can transact real estate in the U.S. Imagine, however, that it were; that is Cuba today. Under the arrangement in Figure 1, the GOC still owns the land, thus, a willing foreign developer’s primary pecuniary motivation would be cash flow. In this regard, the GOC clearly wishes to promote development for productivity’s sake and discourage land speculation. 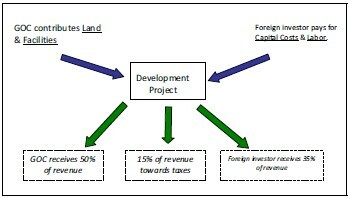 Perhaps recognizing that most developers would be deterred by such an arrangement, the GOC permits the foreign investor to repatriate 100 percent of his after-tax profits.49 The ability to return hard capital provides at least a modicum of risk mitigation against the highly unpredictable nature of this “Frontier Market” investment. The Carbonera Club, when built, will include a hotel and spa, a beach and water sports club, a tennis club, an eighteen-hole golf course and use of the Varadero Yacht Club, and will consist of 720 properties consisting of private villas, one, two and three bedroom apartments and Conran residences spread over 170 hectares on the north coast of Cuba.56 The project is located approximately 40 miles from Havana. In researching this project, I happened upon another such opportunity near the infamous Guantanamo, Cuba. The ad was for 24,000 acres of “Sugar Estates”; the asking price, $48,000,000.57 Although the ad states, “the successful transaction will convey clear title and eliminate conflicts with any government transactions,” a foreign investor permitted to participate in such need be extremely cautious.58 This ad serves as a good opportunity to discuss a particular kind of danger in real estate investment in a frontier market like Cuba—uncertainty of title—as well as to examine additional significant real property laws. A developer should note that North American land use regulation differs “notably” from its Cuban counterpart, according to W. Paul Rosenau, principal of EKISTICS Town Planning, Inc., a Canadian company involved in development work in Cuba.61 There is little consistency in standards or previously allowed exceptions.62 Like many developing nations, all things become “negotiable.” Rosenau advises the GOC enact Havana’s “comprehensive land use, zoning, and master servicing plan before further ‘marketdriven’ real estate development occurs.”63 With this in place, Rosenau adds, there is no reason Havana cannot become a “sustainable” city for the inhabitants, landscape, culture and “commerce that provides its future prosperity.”64 Until that time, however, the developer experienced in the political arena will have a far greater chance of success especially when it comes to negotiations with the GOC and CITMA. Due to the abundance of development opportunities along the coastline of the island, the GOC passed Decree-Law No. 212 in 2000.65 Required setbacks, per the law, are stipulated as follows: 20 meters from beaches, coastal cliffs or “river mouths” and 40 meters from beaches with sandbar or dunes, low coasts, or “fragile coastal zones.”66 In the end, it seems foreign investment in Cuba can be profitable if one understands the somewhat byzantine rules. (As one Canadian tourist consultant remarked: “Doing business in Cuba is a license to print money for Canadians.” 67) However, the pragmatic international real estate investor must weigh those potential gains against several key risks: unclear title, political capriciousness and currency volatility. Disgruntled former land owners submitted nearly 10,000 claims to the Commission.73 The Commission, to determine the value of the claims, took into account: “the basis of valuation most appropriate to the property…including but not limited to, (i) fair market value, (ii) book value, (iii) going concern value, or (iv) cost of replacement.”74 To compensate these individuals,75 the Commission determined that the GOC would incur debt equivalent to the values determined case-by-case according to the aforementioned criteria. As of 1991, the GOC owed nearly $8 billion to these claimants.76 In reality, the odds of a post-Castro GOC paying off this debt are slim. The more than 5,000 U.S. citizens and 898 companies that have pending claims with the U.S. Foreign Claims Settlement Commission are unlikely to be made whole by the GOC.77 This is particularly important as many embittered former Cuban land owners will likely seek compensation—if not the land itself—in the event of a shift in private property rights. There is a joke amongst foreign developers in China: why be upset when discovering a disadvantageous law passed at breakfast, when it will likely be amended by supper. The same may be said of Cuba today. The foreign investor need be acutely aware of the political uncertainty of the GOC. An ostensible lack of legal protection has dissuaded several established developers from carrying out large-scale, sophisticated projects.82 As a result, the GOC has had to accept much smaller projects by less-experienced developers willing to trade high risks for lower rewards.83 The higher risk is clearly associated with the unpredictable nature of the GOC’s decision-making. Take the “Havana Palace” project as a prime example. This 73–unit condominium building with pool and garage was nearing completion in the upscale Miramar section of the Cuban capital.84 Designed to be sold to foreigners with business interests in Cuba, or those merely looking for a Caribbean pied-a-terre, it was one of 17 projects being built under a joint venture construction program authorized by the Cuban government in 1997.85 However, just before the project was to be completed, the GOC suddenly prohibited any foreigner from buying the units.86 A similar project in the area—the Monte Carlo Palace— had experienced a 30 percent increase in profits from re-sales with original starting sales prices at a whopping $1450 per square foot.87 Perhaps sensing an opportunity to capture some of those riches, the Ministry of Foreign Investment and Economic Cooperation said all but a handful of the approximately 2,300 units in the foreign-financed initiative would be purchased by the government and then rented to approved foreign visitors.88 What is particularly alarming is that the developer was not consulted and suffered significant losses due to this unexpected breach.89 Accustomed to a different kind of political system, it is unlikely the developer built in such contingencies in his pro forma. In short, anyone interested in participating in a Cuban real property venture need expect the presence of a predictably unpredictable political regime. Property X: A high rise Shanghai condo is purchased in 2002 for $1 million USD (or 8.3 million RMB). By 2009, on currency appreciation alone, it would be worth $1.21 million or 21% more in value. In this scenario, a property could be sold for 10% less than the purchase price and still yield a double-digit gross profit. Property Y: A high rise London flat is bought in spring of 2008 for $1 million USD (or 500,000 GBP). Based on currency depreciation alone, it would be worth $700,000 less one year later and would require the seller to offload the property at least 42% higher than original purchase price just to break even. Understanding currency fluctuations is likewise important for the foreign real estate developer participating in a joint venture with the GOC. The profitability of the foreign investment—for instance, a hotel resort outside Havana—may depend heavily on the currency in which revenues are earned and expenses are paid. Typically, hard currency is earned by the JV, and imported inputs (e.g., construction materials) are purchased from those earnings.92 The remaining proceeds are then used to buy domestically supplied inputs (e.g., labor) and to allocate the profit to the GOC and foreign partners.93 The JV must pay its domestic expenses in the local currency of pesos at a negotiated exchange rate.94 Ultimately, these negotiated rates can make or break an investment’s returns. In short, there are several risks associated with investing in a volatile frontier market such as Cuba. Some of these risks would be found in any international real estate investment. Whether the participant is investing passively by purchasing condominium units in an existing development or is participating in a joint venture with the GOC, the key risk associated with Cuba is uncertainty. The next section explores the possibilities of change in Cuba and specifically seeks to determine if this future will mean more or less certainty. FINAL THOUGHTS: THE ENGINE OF FUTURE RETURNS? Until major reforms are made in Cuba by the GOC and US politicians, US citizens will be banned from participating in real property opportunities and Cubans and other foreigners will have very limited access. However, if specific reforms are made, the likelihood of an investor experiencing returns akin to Estonia or Vietnam may be very high. The primary driver of that development will be the same engine that the Castros jumpstarted during the “Special Period” to prevent their economy from collapsing: tourism. In April 2009, in addition to removing ceilings on remittances, President Obama lifted restrictions on travel for Cuban-Americans wishing to visit relatives on the island.95 This was an important move and one that might signal further policy changes. If Obama enacts a law to allow all US citizens to travel to Cuba, the impact on Cuban tourism numbers may be startling. In fact, some speculate that were the Embargo and accompanying travel ban removed, Cuban tourism numbers would increase six-fold from approximately 2 million per annum to 12 million.96 This increase may seem far-fetched; however, when you consider the proximity of Cuba to popular tourist destinations such as Cancun (approx. 100 miles), Jamaica (approx. 100 miles) and the Florida Keys (approx. 90 miles), you realize that this prediction may have some merit. Naturally, general economic growth—including real property appreciation— may follow. Were legislation passed allowing ownership of private property in Cuba, the vast majority of American developers and property investors would likely still hesitate. However, with the high levels of risk associated with domestic investments on US soil, commensurate returns become all the more appealing even for frontier markets. In other words, were one to have the same risk developing land in Riverside, California as in Havana, Cuba, but expected returns being tenfold with the latter, the appeal of investing in Cuba becomes that much greater. Philip T. Fitzgerald, managing director for emerging markets at Los Angeles- based Paladin Realty Partners LLC, recently said: “The U.S. is now an emerging market.”103 If U.S. real estate begins to have the risk associated with emerging markets but the modest returns associated with safer investments, how might that impact the kinds of risks investors might make? Take Blackstone for instance: the Private Equity group recently closed a $10.9 billion dollar fund in 2008 with a significant portion earmarked for “global investing.”104 Since going public, pressure for growth by Wall Street has likely caused the Blackstone executives to consider more than U.S.-distressed real estate assets. In April of 2009, their stock was down 90% from its IPO price of $35 back in the company’s heyday of 2007.105 When you consider the ostensible demand for housing that Cuba has today, as well as the dire need for significant infrastructure improvements, the island is a potentially viable play. Blackstone may have to keep its powder dry for some time. For it should be understood that a transition from mortal enemies to bosom buddies does not take days. Truthfully, it may take decades. A casual stroll down the Malecón, which borders the Havana coastline, will provide one views of hundreds of gleeful kids playing stickball in the streets. But the tourist is shielded from the underlying animosities inculcated over decades of anti-Westerner indoctrination coupled with a kind of inevitable envy or distaste for all that the West might represent: hyper commercialism, environmental destruction, greed, severe class differences, imperialism, exploitation, racism and the like. Communism even with its countless flaws has proven that it can educate its people: Cubans are literate, accustomed to quality medical care and able to contemplate complex ideas. It is not unusual for a bus driver to debate abstruse political concepts. This same bus driver—intellectually curious but lacking a more lucrative marketable skill—may find himself a lost man in a post-embargo Cuba as he is habitually subjected to throngs of drunken tourists accustomed to a different set of cultural norms. 1. Real Estate Financing in Estonia, Edited by David, Richard M. (Paul Varul Law Firm). World Finance. Fall 2007. 2. The equivalent in the US to a freehold condominium. 3. Statistics Estonia. As cited in House Prices Plunge in Estonia. Global Property Guide. January 17, 2009. 4. Between Hanoi and Havana. Castañeda, Jorge. Newsweek. Aug 4, 2008. 5. Flirting with Capitalism: Rebuilding Havana will require not only foreign investment, but also a government committed to creating a healthy city. Rosenau, W. Paul; Fenske, Paul and Gilderbloom, John. Urban Land. October 2002. 98, 98–103. 11. Burnham, Bonnie. Lecturer for panel entitled, Cuba on the Brink: The Next Great Development Opportunity. Held at the Urban Land Institute’s 2008 Fall Meeting. Miami, Florida. 12. After Fidel: Raúl Castro and the Future of Cuba’s Revolution. Latell, Brian. Palgrave MacMillan: 2005 239, 1 275. 14. Flirting with Capitalism. 98, 98–103. 21. Interview with Pedro Freyre (Co-Chair of Akerman Senterfitt law firm’s Global Practice Group based out of Miami): April 16, 2009. 11:45am–12:45pm PST. 25. 26 USC §1031. Exchange of property held for productive use or investment. 28. Each Saturday morning, hundreds of people gather on the Paseo del Prado in central Havana in the hopes of finding someone willing to swap homes. 29. The Black Market: Cuba Burns with Real Estate Fever on the Sly. Lacey, Marc. International Herald Tribune. January 28, 2008. 31. The Black Market: Cuba Burns with Real Estate Fever on the Sly. 33. Cuba Libre? Uncertainty and controversy build as Cubans anticipate economic reforms following Fidel Castro’s resignation. Mehaffy, Michael. Urban Land. March, 2008. 102, 101–105. 36. Cuba’s Black Market Housing Boom. Pressly, Linda. BBC Radio: “Crossing Continents.” January 2, 2009. 37. The Black Market: Cuba Burns with Real Estate Fever on the Sly. 38. Cuba’s Black Market Housing Boom. 39. Cuban-Americans Favor Obama’s Shift in Policy, Harwood, John. New York Times. April 20, 2009. 40. Freyre, Pedro A (Co-Chair, Akerman Senterfitt’s Global Practice Group). Lecturer for panel entitled, Cuba on the Brink: The Next Great Development Opportunity. Held at the Urban Land Institute’s 2008 Fall Meeting. Miami, Florida. 41. Toward a Culture of Nature. Stricker, Pamela. Lexington Books: 2007. 75, 1–149. 42. Flirting with Capitalism. 100, 98–103. 44. Toward a Culture of Nature. 89, 1–149. 45. Art. 2, Law No. 77 (Toward a Culture of Nature. 87, 1–149). 46. Cuba Today and Tomorrow: Reinventing Socialism. Azicri, Max. University Press of Florida: 2000. 220, 1–416. 48. Cuba’s Hesitant Dance with Economic Freedom. DeYoung, Karen. International Herald Tribune. July 25, 2000. Indian Tractors, Cuban Cigars, Chronicle Staff. Latin Business Chronicle. March 6, 2009. 52. Granma Internacional. March 18, 2004; Toward a Culture of Nature. 89, 1–149. 55. Carbonera Club Opens Application Phase for New Vacation Resort in Cuba. Sequin, Rob. Havana Journal. November 24, 2008. 59. Toward a Culture of Nature. 90, 1–149. 61. Flirting with Capitalism. 101, 98–103. 65. Toward a Culture of Nature. 91, 1–149. 67. Flirting with Capitalism. 98, 98–103. 71. How to Invest in Cuban Real Estate—Wait. Eaton, Tracey. The Dallas Morning News. February 22, 2005. 75. It is interesting to note that OfficeMax, Inc. holds what has been the largest single U.S. claim against the GOC for confiscated property via its ownership of a majority stake in Cuban Electric Co., the main pre-Castro electricity system. Businesses Hold Few Hopes of More Trade Soon, Dade, Corey. The Wall Street Journal. February 20, 2008. 76. Options for Retiring Cuba’s External Debt. Lasaga, Manuel. La Sociedad Económica. Pg. 2. March 4, 1993. 77. Property Bonanza Awaits Investors in Post-Castro Era. Eaton, Tracey. CubaNews (Newsletter). April 2005. Pg 14 of 16. Citing CubaNews, February 2005, pages 1 and 8–9. 78. Interview with Pedro Freyre: April 16, 2009. 11:45am–12:45pm PST. 79. Property Bonanza Awaits Investors in Post-Castro Era. 14, 1–16. 81. 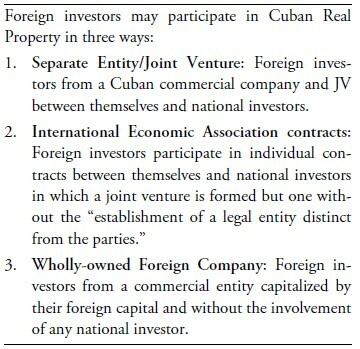 Creditors’ Rights: Claims against Cuban Confiscated Assets. Helander, Robert C. 42, 37–44. As published in Investing in Cuba: Problems and Prospects. Edited by Suchlicki, Jaime & Jorge, Antonio. Transaction Publishers: 1994. 42, 1–176. 82. Flirting with Capitalism. 102, 98–103. 86. Cuba’s Hesitant Dance with Economic Freedom. 87. Flirting with Capitalism. 102, 98–103. 90. (1) Based on spot rate of 6.83 RMB to $1.00 USD. (2) Historical exchange rates of RMB at 6.85 to $1.00 USD as of March 17, 2009 vs. 8.28 to $1.00 USD in March 2002. (3) Historical exchange rate of GBP:USD at approximately $2.00 USD to ₤1.00 as of March 17, 2008 vs. $1.40 USD to ₤1.00 on March 17, 2009. 92. Foreign Investment Opportunities in Cuba: Evaluating the Risks. Jorge, Antonio & Cruz, Robert David. 30, 17–42. As published in Investing in Cuba: Problems and Prospects. Edited by Suchlicki, Jaime & Jorge, Antonio. Transaction Publishers: 1994. 30, 1–176. 95. Cuban-Americans Favor Obama’s Shift in Policy. 96. Flirting with Capitalism. 102, 98–103. 97. Only In Miami, Lyrics by Midler, Bette. Atlantic Records. 1993. 98. Between Hanoi And Havana. Castañeda, Jorge. Newsweek. Aug 4, 2008. 99. Cuba’s Diplomatic Paradox, Castañeda, Jorge. The Wall Street Journal, December 27, 2008. 101. Between Hanoi And Havana. 103. U.S. is Now an Emerging Market, Karp, Jonathan; Hudson, Kris and Troijanovski, Anton. The Wall Street Journal, October 29, 2008. 104. Blackstone Raises a $10.9 Billion Fund, The Wall Street Journal, April 1, 2008. 106. Burnham, Bonnie. Lecturer for panel entitled, Cuba on the Brink: The Next Great Development Opportunity. Held at the Urban Land Institute’s 2008 Fall Meeting. Miami, Florida. 108. The Great Gatsby, Fitzgerald, F. Scott. Scribner: 1925. 20, 186. Richard M. David currently practices investment fund formation law at a large, multi-national law firm in New York City. While in law school he earned several international fellowships relating to emerging/frontier market investments with a particular emphasis on international real estate investment.